Animal Wildlife | Little Penguin | The little penguin is the smallest species of penguin in the world, with the average adult little penguin rarely reaching half a meter in height. 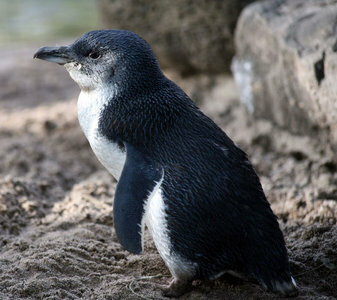 The little penguin has a number of other common names including the fairy penguin, the little blue penguin and simply just the blue penguin. 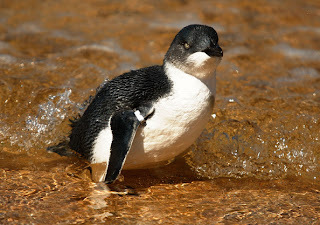 The little penguin is one of the few species of penguin to be found north of the Antarctic Ocean, as this small species is found inhabiting the rocky coastlines of New Zealand, Tasmania and parts of southern Australia. There have also been reports of the little penguin being found in Chile and in parts of South Africa. 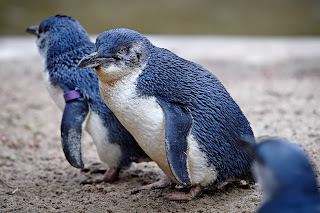 The little penguin is named both for is small size (with the average weight being just over 1kg) and for it's blue coloured feathers. The short feathers of the little penguin are of a blue/grey colour with a large white patch on their underside, which makes these birds very distinctive amongst all penguin species. 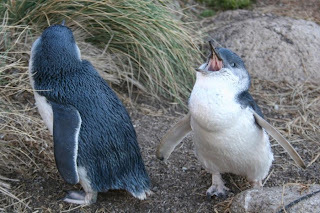 The little penguin is one of the only species that is under threat from land-based mammalian predators and so have evolved to making their tiny appearance more intimidating. Little penguin spend the whole year together as a colony so that they are able to employ the safety in numbers strategy when there are hungry predators about. The little penguin is a carnivorous animal, that like all other penguin species, survives on a diet that is only comprised of marine animals. Krill and small crustaceans make up the bulk of the little penguin's diet along with larger organisms including squid and various species of fish. 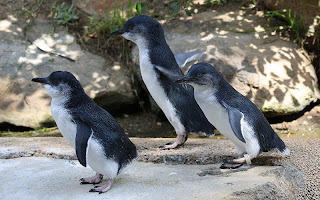 Little penguins are more under threat from land-based animals such as dogs, cats and foxes that have been introduced into their native habitats. However, larger marine animals will also prey on these water-based birds, with fur seals, leopard seals, sharks, humans and killer whales being the main predators of the little penguin. On average, the little penguin breeds once a year, forming pairs that usually remain faithful to one another. The female little penguin lays two eggs into a self-dug burrow which are incubated by both parents for just over a month, when only one of the eggs will usually hatch. The little penguin chicks are fed and kept warm by their parents and remain with them until the chicks are around three months old. Today, the little penguin populations have been declining with the increasingly threat from non-native carnivores. Little penguins however, are often found on islands that have been declared National Parks where tourists are able to see the little penguin colony in it's natural habitat and are not allowed to take photos. 2 Responses to "Little Penguin"